I received my medal for completing the PCT on Wednesday! I had been looking forward to that since before I started!! (Somewhere along my journey, Fun Size crushed my dreams by telling me it was a fake medal made out of chocolate! No! No… Don’t do this to me! …He left me thinking that it really was chocolate. Fortunately, I can confirm that it is a real, hefty medal! I feel proud. And I love the PCTA for giving these out!). My computer is presently in the hospital for a two night stay, as it had been in near death condition when I returned. Hopefully, it will soon be revived and then I can get to work on my many projects. I recently dipped into depression land as the result of too much loneliness. No one has time to break from their busy schedules and hang out with a girl who has so many stories to tell about traveling from Mexico to Canada. It makes me very sad. And it got to the point where I was feeling very angry in the grocery store. Why don’t I know anyone here? Why don’t I have friends here? It was so great to always run into fellow hikers at nearly every store and restaurant I went into along the trail. Automatic friends. Such a close- knit, connected community. 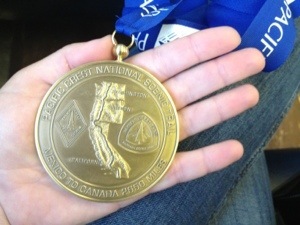 This entry was posted in Uncategorized and tagged Life after the Pacific Crest Trail, PCT 2013 blog, PCT medal by Wendy. Bookmark the permalink. Congrats on the hike and your medal. It is well deserved. I did! It was incredibly difficult and awful, but my spirit really wanted to be out there, hiking the whole thing! I’m not sure if my stubbornness has resulted in life-long problems (I’m still not over it)… but I guess time will tell! Thank you so much for your empathy! !